Since its inauguration the biodiversity research collection has continued to grow, specimens are being databased and curated properly to insure their longevity. The collection offers unique opportunities for undergraduates to acquire skills in the curation of natural history collections. Every year undergraduate and graduate students sign-up for our course on Natural History Collections, and complement it with internships in the various collections. You can help us promote enhance the scientific and academic value of the collection by contributing to our endowment, which will fund student internships (see below) providing them with a unique learning experience while further enhancing the quality of the nearly 1 million specimens we house. It is easy to give! Go to the secure online giving site and register with the The University of Connecticut Foundation, Inc. Check the box for “Other gift designation not listed above” and in the “Gift Designation” box, and enter the number (30976) and name of the EEB Endowment (Biodiversity Research Collections ). Or send a check, payable to the University of Connecticut Foundation, indicating the account number (30976) in the memo section (lower left), either directly to the UCONN Foundation at 2390 Alumni Drive, U-3206, Storrs, CT 06269-3206 or to Pat Anderson (EEB’s Business Services Supervisor), Department of Ecology and Evolutionary Biology, 75 NorthEagleville road, University of Connecticut, Storrs CT, 06269-3043. If you have any questions please call Pat Anderson (860 486 4323) or Bernard Goffinet (director, 860 486 5290). Vertebrate collection: Undergraduates Timothy Pullen (EEB BS/MS ’18) and Jake Perfetto (Bio ’17) received fellowships from our collection endowment for projects associated with the Mammal and Herp collections respectively. Jessica Cebelius (ECSU ‘17) volunteered in the bird collection, rounding out a summer of labwork at ECSU with curatorial experience. Their primary objective was to bring our specimen data to full conformation with Darwin Core standards. Once the projects are finished, the data will be submitted to VertNet to be published online. In natural history collections, it’s usually better to have more rather than fewer specimens, but this summer Tim Pullen’s task was to reduce the number of specimen entries in the mammal database – by eliminating duplicate records. Many of these nearly 5000 records turned out to be skulls stored separately from their skins, which he tracked down and reunited – to a single specimen record. Discrepancies in earlier data-entry efforts were not uncommon, especially regarding collecting locations. Correcting these led Tim down the Trans-Chaco Highway of Paraguay, along the routes of several collecting expeditions, where in addition to geo-referencing many collecting events, he ultimately learned quite a bit about the geography of that country. After Tim’s summer efforts, 2445 new specimen records will be sent to VertNet, to be added to UConn’s mammal dataset of 9889 records, which was published in April 2016. The next major database overhaul, in preparation for its online debut, will be that of the reptiles and amphibians. Jake Perfetto, BIO ‘17 and EEB PhD candidate Annette Evans both worked with the Herp collection this summer, on tasks ranging from the inventory of gallon jars of wood frogs to making sense of specimens on the “problems” shelf. For both, the goal was to ascertain that our specimen data was as accurate as possible. Jake’s main focus was to comb through an excel file containing a veritable mountain of frog and salamander collecting data, to format names, dates and locations. Usually the specimen accession ledger would help clarify details of collecting events, but sometimes it further confused – for example, Jake encountered at least three variations on the same collecting location. Using a combination of written description and Google Earth maps, he was able to clarify spelling errors and geo-reference that specific salamander collecting event, placing it along the Long Trail in Vermont’s Green Mountains. 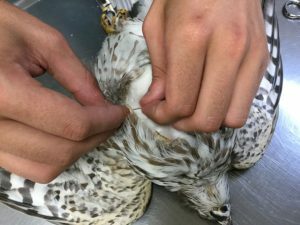 As a finale to a summer of data-entry, both students spent time in the vertebrate preparation lab, learning how to make bird study skins. The results will be incorporated into the Biodiversity Research Collection … as soon as the collecting localities are geo-referenced! Invertebrate collection: The Biodiversity Research Collections Endowment partially supported three undergraduate students in the invertebrate collection. These interns explored the Carl and Marian Rettenmeyer Army Ant Guest Collection and learned a variety of valuable laboratory techniques in a museum setting. Our 3 interns learned to interpret data gathered in the field for entry into a standardized computer format. They became familiar with ant and other insect taxonomy as they entered data and transferred thousands of specimens into new containers. The interns also learned the skills necessary to convert paper records into electronic images that will be associated with the specimen data. All three contributed posts to social media explaining the project and their participation in it (see the Army Ant Guest Collection on Facebook). Herbarium: Haley Herring-Sylvestre, a senior in EEB, contributed to the curation of several hundred bryophyte and lichen specimens that had been in storage and are now added to the herbarium and entered to the national databases. Initially, her work focused on processing the Rosentreter lichen specimens. These needed first to be imaged so that information on each specimen (barcode, species name, label image) could be entered into the North American Lichen Herbaria portal. She added about 150 specimens to the filed collections. Next Haley processed several other boxes of specimens of lichens and mosses that had been in storage. These included dozens of specimens collected by Ken Metzler, primarily mosses collected in Connecticut. All of these needed to be repackaged before they could be imaged, databased and filed. Haley gained experience in specimen curation and databasing, contributing to the preservation of collection and their availability to researchers across the globe. Sara Horwitz (MS candidate), Melanie Amodio ’13 and Lyndsay Stockwell ’13 worked in the liquid preserved reptile collection, creating a database, curating and organizing specimens. Casey James incorporated a collection of moths donated by a MA resident, reorganized 88 drawers of Noctuoidea collections , providing each new unit tray with a new label and numbering each species according to the latest checklist revisions. Ariel Gonzalez ’11 accessioned an acquired gift of bird study skins from the Science Center of Connecticut, cataloguing, databasing and preparing the specimens for integration into our research collection. Rachel Grenon (BSMS) accessioned about 2000 microscope slides of historic significance (the Alexander collection) into the LRPenner Parasitology collection. This involved numbering individual slides and entering data about them into a spreadsheet. Lionel Moirez ’10, accessioned a large collection of birds’ eggs donated by Farmington’s Barney Library, databasing and cataloguing more than 1000 specimens.